The Enhanced series luminaires are designed as a superior lighting solution for parking areas, streets, walkways and car lots. The housing is constructed of durable formed aluminum. All seams are expertly welded and sealed so that no live parts are left voulnerable to the harshest of environments. 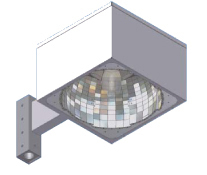 Luminaires are provided with easy entry top-cap for ballast maintenance. The door frame is fabricated from a single piece of sheet aluminum. The lens is sealed in place and a door gasket is provided for weather-tight protection. A polyester powder coat finish backed by a one year finish warranty. Standard colors available: bronze, black, white. Custom colors available. A standard faceted reflector that uses enhanced components to spread the light in the most efficient manner. The improved glass lens is clear, and tempered with a minimum thickness of .125". Each high efficiency, durable ballast is pre-wired and installed for your convenience. Ballast are available in a range of wattages to suit each need. ETL listed suitable for wet locations. One year warranty on the fixture and finish, one year on the ballast and lamps.